Help Shadr clear his debt with Sapphire. Sapphire demands Shadr pay his debts. Observe the conversation between Sapphire and Shadr. Speak with Sapphire and either pay or persuade her to clear the debt. 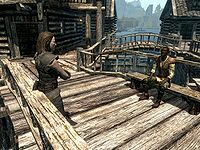 Upon your initial entry to Riften, a conversation will take place between Sapphire, a member of the Thieves Guild, and Shadr. She is berating him for not paying his debt, to which he replies that he couldn't because his shipment was attacked. Sapphire alludes to the fact that she was behind it, but doesn't forgive his debt and demands that he pay it. She then walks off towards The Bee and Barb. Shadr usually[verification needed] sits down on the bench, and when you talk to him you hear a rehash of the situation along with his helplessness. You may then offer to assist him. If you are not a member of the Thieves Guild: You are presented with the options of persuading Sapphire to clear the debt or paying it yourself. If you are a member of the Thieves Guild: You will be presented with the same options for persuading, but convincing Sapphire will take a bit more skill. You can also threaten to expose her scheme to Brynjolf for a cut. If you are the Guildmaster: Sapphire will apologize about the scam and claim that she was going to talk with Delvin about cutting the Guild into the deal. You can either tell her to forget about the debt or split the money. If you accept the cut-in, you still need to return to Shadr to complete the quest. If you were successful in having Sapphire erase the debt, return to Shadr who is grateful and gives you a leveled potion of invisibility. This will also increase Shadr's disposition towards you, meaning that you may be able to take items from the Riften Stables, including borrowing a horse. Your cut of the deal, if you take Sapphire's offer, will be five hundred gold. Sapphire may not talk to you during this quest. Simply opening up the console and using the command resetquest freeformriften22 followed by setstage freeformriften22 10 re-enables the quest trigger dialogue with Shadr. Don't simply reject helping him (as it triggers the bug) and just talk to Sapphire as usual and the quest will proceed as normal. If you do want to reject helping Shadr (and forfeit the quest reward), you will need to use stopquest freeformriften22 to get Sapphire to leave the Bee and Barb and move to The Ragged Flagon. Sapphire will be 'locked' in place at the Thieves Guild during the quest The Pursuit and neither this quest nor delivery of Glover's Letter can progress. Her only response will be something to the effect of cutting off Mercer's foot. Simply walk over to Brynjolf and finish The Pursuit quest and Sapphire will move to The Bee & Barb and her related quests can be completed. In order to successfully intimidate Sapphire into dropping the debt, you need a speech level which is unattainable without cheats. On the PC, it is possible to use the console to advance through the quest by entering setstage FreeformRiften22 stage, where stage is the number of the stage you wish to complete. It is not possible to un-complete (i.e. go back) quest stages, but it is possible to clear all stages of the quest using resetquest FreeformRiften22. Esta página foi modificada pela última vez à(s) 10h46min de 19 de novembro de 2015.